Chia seeds are an amazing superfood, especially for athletes. As athletes, we strive to achieve optimal endurance and strength, proper hydration, and muscle building and repair. Chia seeds can help you attain all of these. The tiny black and white seeds come from an ancient plant used for its nutritional benefits and medicinal uses. The seeds were used by the Incans, Mayans and Aztecs and were considered a magical seed, providing strength and stamina over long periods of times. The running messengers relied heavily on them, carrying a small pouch around to provide sustainable energy on their long journeys. The word “Chia” is actually the Mayan word for strength. As scientists and researchers are realizing the lack of certain key nutrients in the Standard American Diet (SAD), they are turning to history for natural solutions. There has been much research over the past few years on the powerful nutritional benefits of the chia seed. Chia seeds are rich in trace minerals, vitamins, fiber, omega fatty acids, calcium, antioxidants and much more. They have a rich concentration of essential fatty acids, with an almost perfect ratio of Omega 3 to Omega 6 for healthy tissue and muscle maintenance and repair. Chia seeds are considered to be hydrophilic, meaning they absorb large amounts of water quickly (10x their weight). Thus, they are great enhancers of hydration, as well as promoters of electrolyte balance- key elements for peak performance. Chia seeds are a great pre-workout superfood for the obvious endurance and hydrating benefits. In addition, they contain large amounts of calcium, potassium and iron. These are essential vitamins and minerals that are lost through sweat and muscle contraction, making chia seeds a great post- workout and restorative snack as well. They are easily absorbed and digested, resulting in quick transportation and utilization of the tissues and cells. Chia seeds also contain protein, also essential for post-workout recovery – aiding in muscle building and repair. I’ve touched most of the benefits this powerful little seed has to offer. You can see why these are a great addition to any diet – especially for athletes and those looking to improve stamina and performance. Try for yourself first hand and start reaping the benefits of this mighty little seed! Put 1 tsp in glass of water and stir. Allow to sit for about ten minutes. Sip pre- or post- workout. 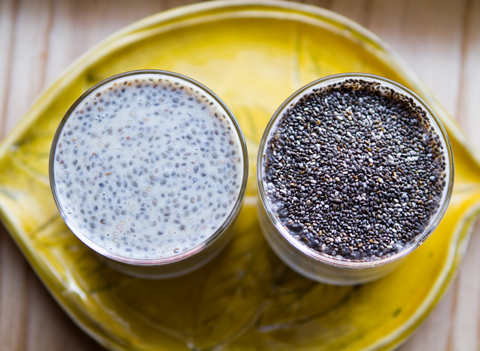 In a seal tight container, add ¼ cup chia seeds to 1 cup water. Refrigerate overnight. This will form chia ‘gel’ which is great for smoothies and yogurt parfaits. Add to any of your favorite granola, granola bar, or overnight oats recipes. Make chia seed pudding (recipe below). Final Day of our Fall Detox! I can’t believe we are on the final day of our Fall Detox! I hope everyone is feeling energized and grounded after nourishing our bodies and releasing those unwanted toxins. Do you feel a difference in your energy level? Your mood? Your cravings? I would love to hear your feedback. I really enjoyed seeing everyone and working together this past week. It’s always great to have support during a cleanse or any kind of health goal you are trying to achieve. Chia Seeds are tiny, yet mighty. They are loaded with omega 3s, which are essential for optimal health, specifically in healthy brain functioning. Chia also help to slow digestion, preventing blood sugar from spiking. Chia’s stabilizing effect on blood sugar may also fights insulin resistance which can be associated with excess belly fat. They also contain a high dose of fiber (11 g in 1 oz serving), aiding digestion and helping to keep fuller longer. They pack in a healthy dose of protein, calcium, phosphorous and manganese. Coconut – the flesh of coconut contains essential fatty acids (the medium chain), fiber, manganese (helps stabilize blood sugar and aid in a healthy immune and nervous system function. It also contains copper, which promotes healthy red cell production and potassium, which maintains proper level of water in the cells and helps regulate water retention. The coconut cream is just the water of the coconut blended with the coconut meat (usually found in a can, or you can make your own). Coconut water is very hydrating and restores and balances electrolytes. Although coconut oil isn’t added into this smoothie, it definitely can be. I already went over the benefits of coconut oil here. 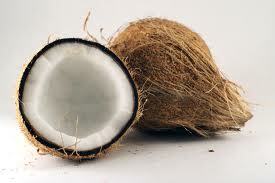 Coconut is also known to speed your metabolism while regulating blood sugar and keeping you full. Although it is often looked down upon because of its high saturated fat content, I believe it should be included in a healthy diet. As I mentioned in my previous post, the fat comes from Medium Chain Fatty Acids, which have healthy benefits, unlike the Long Chain Fatty Acids. Cinnamon not only adds flavor to any meal, it has many notable health properties. Cinnamon is known to increase energy, vitality, and circulation. It is also known to level blood sugar levels and also have anti-inflammatory properties. Be sure to check back on my blog for healthy tips and some yummy recipes! Please be in touch and let me know any health questions or concerns you may have.